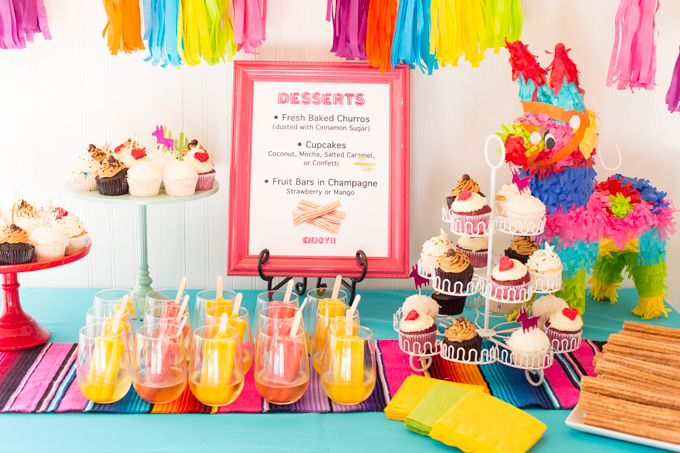 I love hosting parties, and this Fiesta Themed Bridal Shower was one of my favorites! 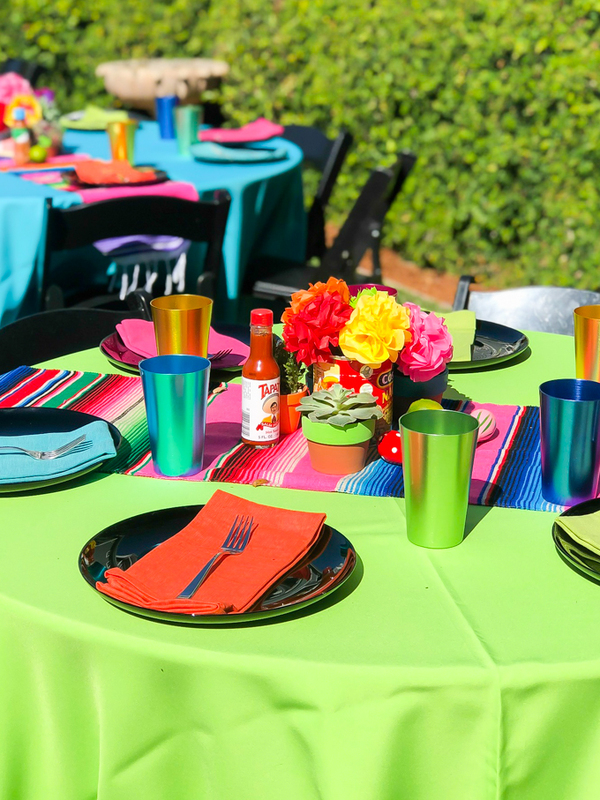 The details for a Fiesta Themed Party are so fun and bright, and it was actually quite simple to theme every detail. 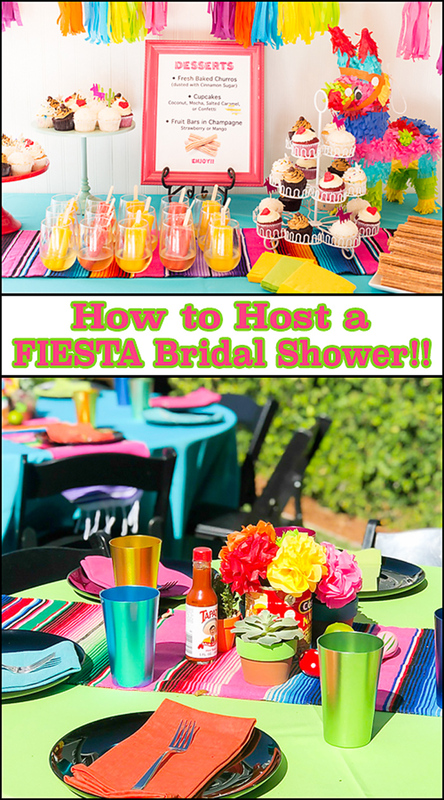 In this post, I’m going to share How to Host a Fiesta Bridal Shower and how and where I took shortcuts to make it a manageable event. I like to start my theming for any event at the front door. I want guests to immediately feel welcomed to my home! 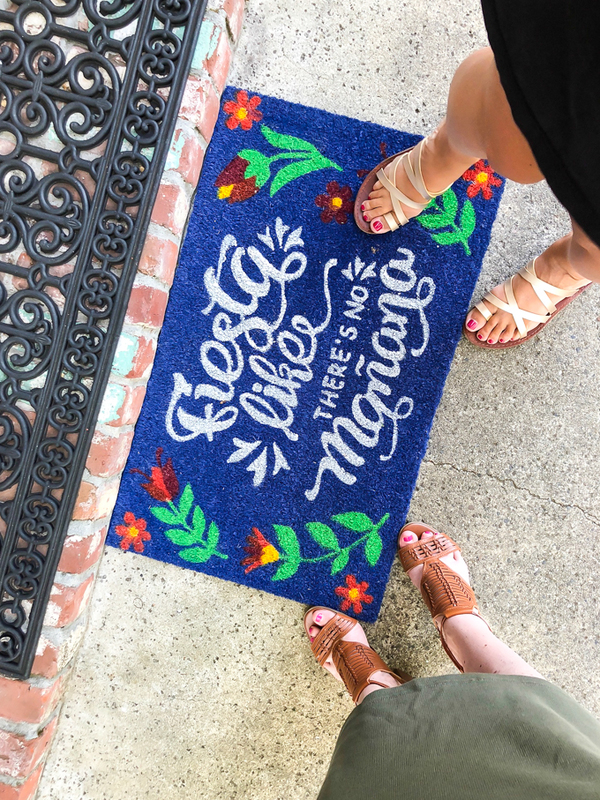 I couldn’t resist this door mat that I found at Pier 1 and of course I always love using a welcome chalkboard on my porch. As guests arrive inside, I show them where they can set their purses and/or jackets, where to place their gifts, and of course show them where the restroom is. I also point them in the direction of appetizers and drinks. The large chalkboard below is used for every event! I wish I could take credit for the beautiful artwork, but I always call on a dear friend of mine. I have absolutely no talent in the art department. 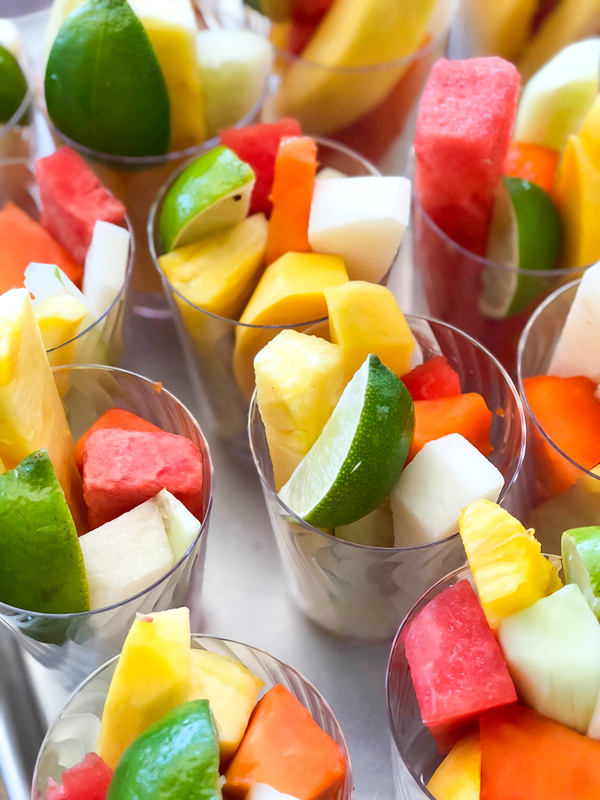 Drinks and appetizers are next up! 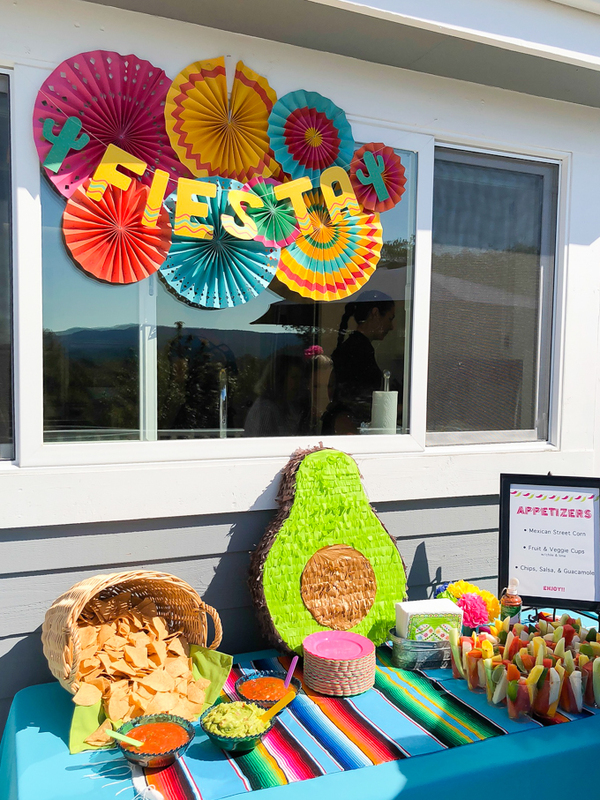 For this Fiesta Themed Shower we offered a few drink options: Mexican Sodas, Topo Chico Sparkling Water, Corona Beer, and of course a Self Serve Margarita Bar! The sodas, beer, and waters were in beverage coolers on the other side of the deck. I purposely try to “spread” food and drinks out so that there is room to move around. 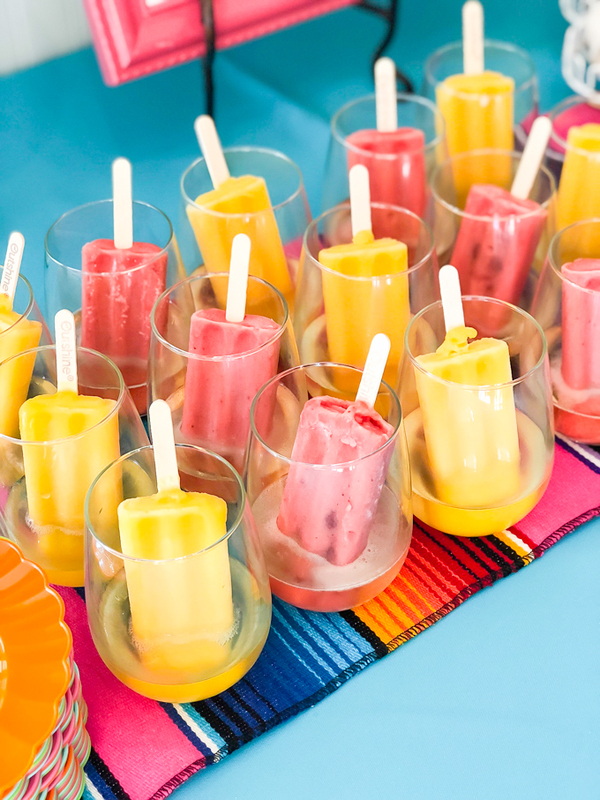 I will admit the Margarita Bar was a crowded hang out at this shower! 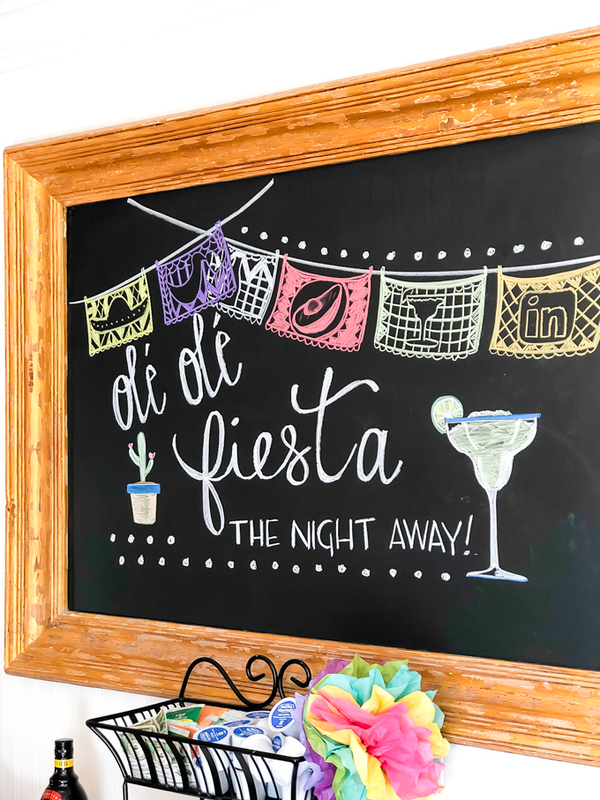 I made a simple sign (in photoshop) with simple “how to” instructions to make a delicious margarita! 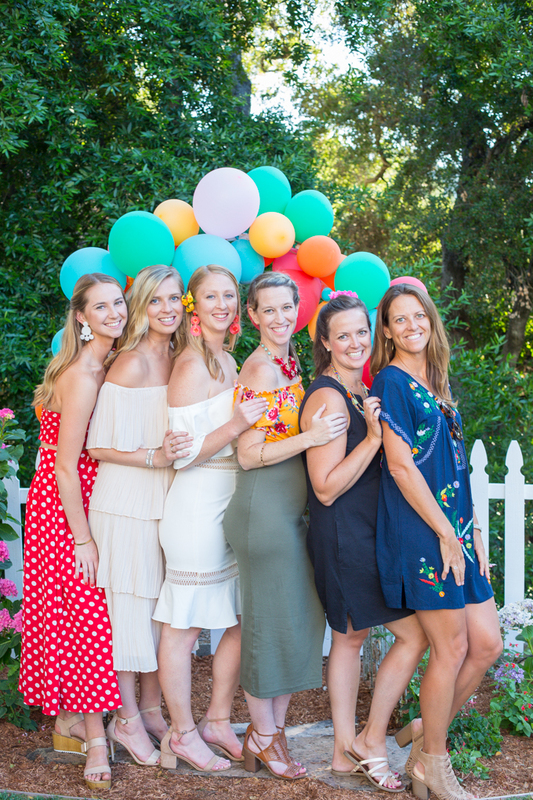 This fun Fiesta Themed Bridal Party was for my niece and I was honored to host it for her! 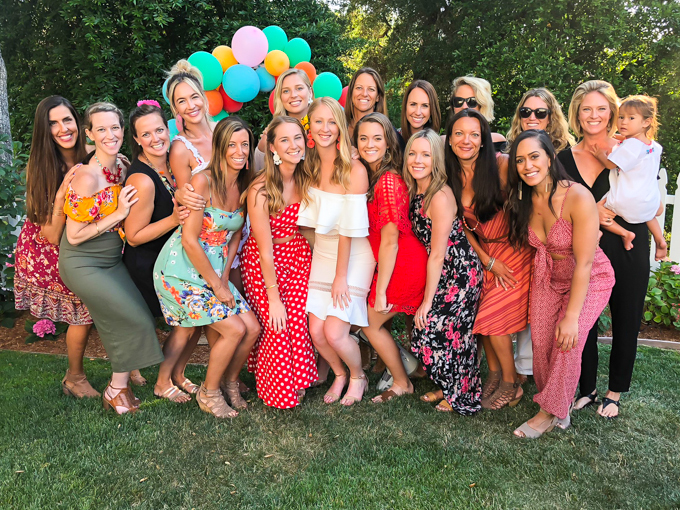 My sister-in-law and I have hosted nearly all of the bridal showers in our family and as soon as my niece became engaged I knew I’d host this event. 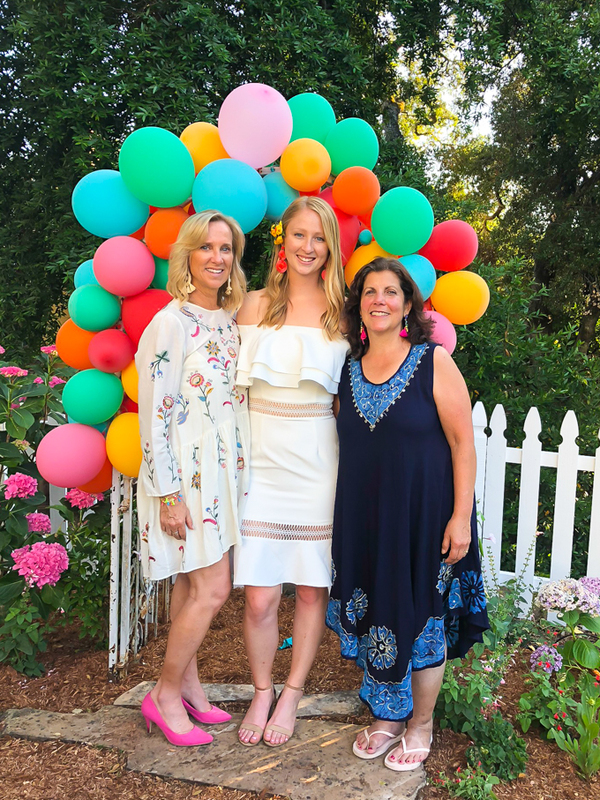 My sister-in-law hosted an amazing Brunch Shower for my youngest daughter about two years ago and I knew that when her daughters got engaged, I’d be hosting theirs. 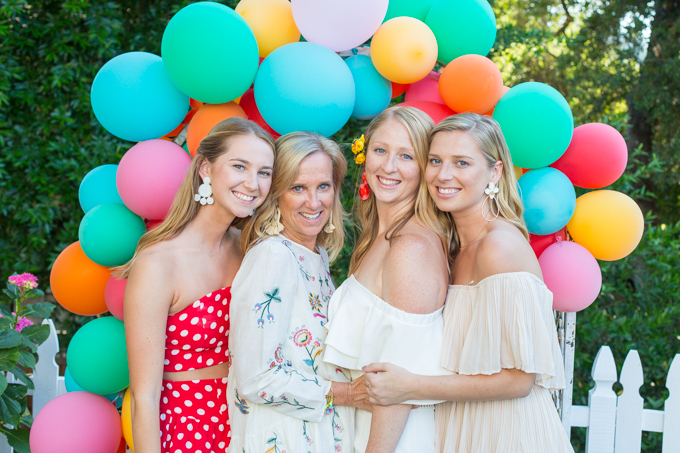 One down, two to go….. Here’s the bride with her mom and two sisters (the bride to be is second from the right). I took a few shortcuts on the appetizers I served. Mexican Street Corn is always a favorite when I make it and it knew it would fit the theming of this shower. 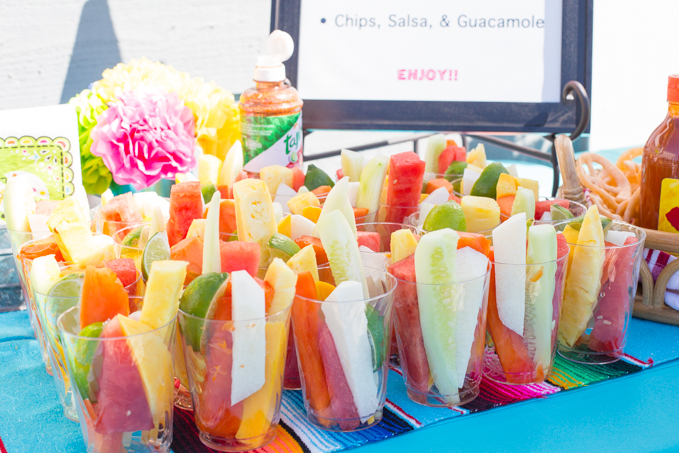 Besides the corn, I served individual fruit/veggie cups with fresh lime and Tajin chili powder. 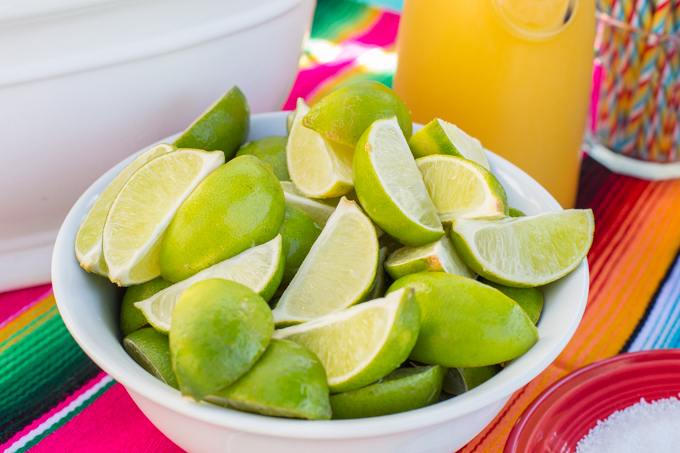 I know of a little Mexican produce market and they sliced all the fruit and veggies for me. This was such time saver and the cost was about equal to what I would have paid for it uncut. 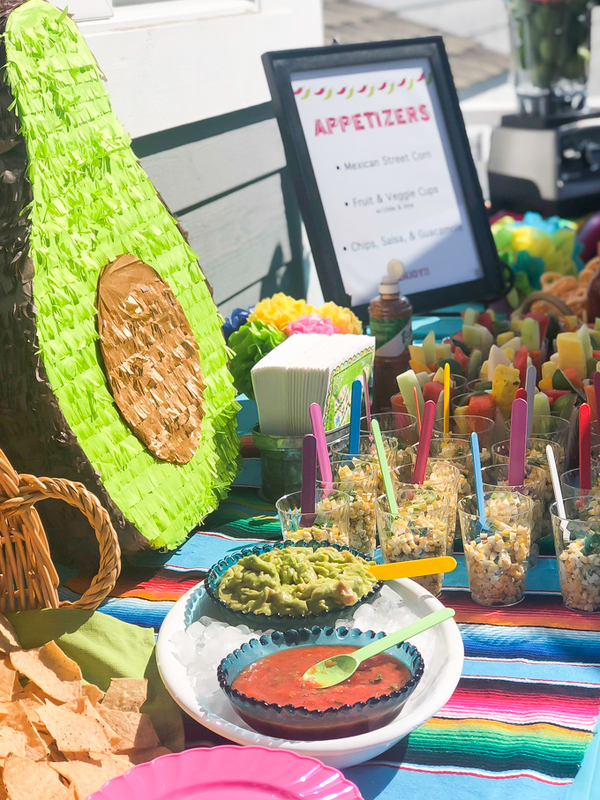 I also set out tortilla chips w/salsa and guacamole (provided by my taco caterer). After about an hour of mingling with Margaritas and appetizers, we moved down to our lower yard where I had tables set. 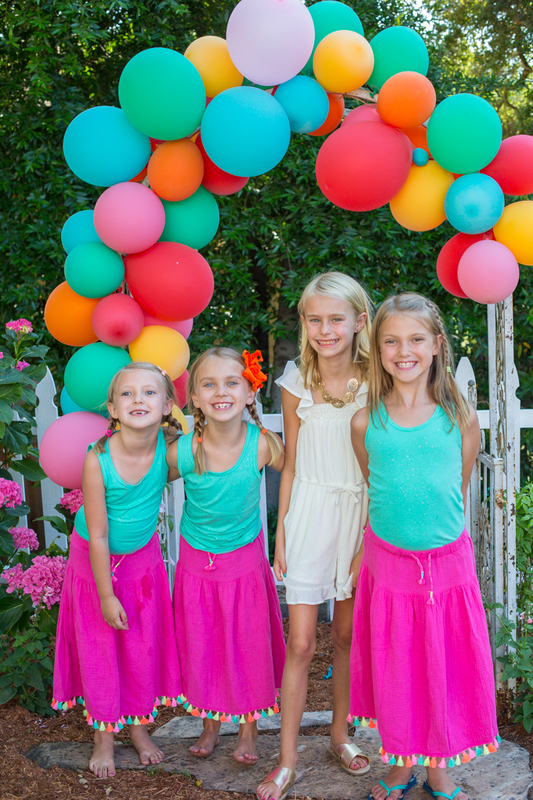 I don’t have a picture to share, but before we moved down to the dining tables, these sweet little cousins (two are flower girls), led us all in the Macarena!! How could you not want to break out in dance with these four?? I love the way the table decor came together. I rented the tables, chairs, and black plates. 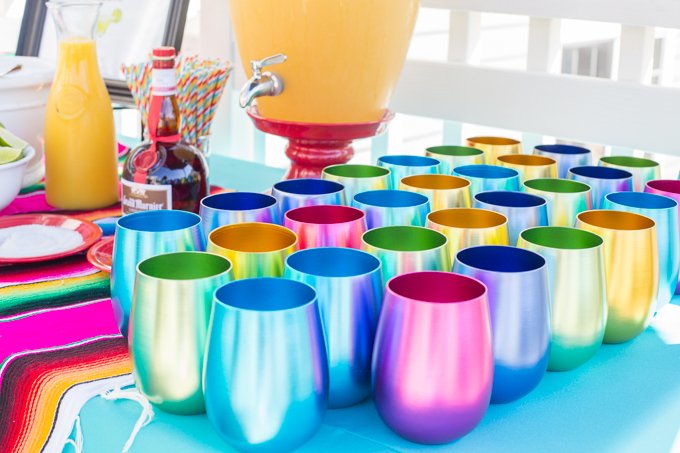 The napkins and bright aluminum cups I purchased from Pier 1. 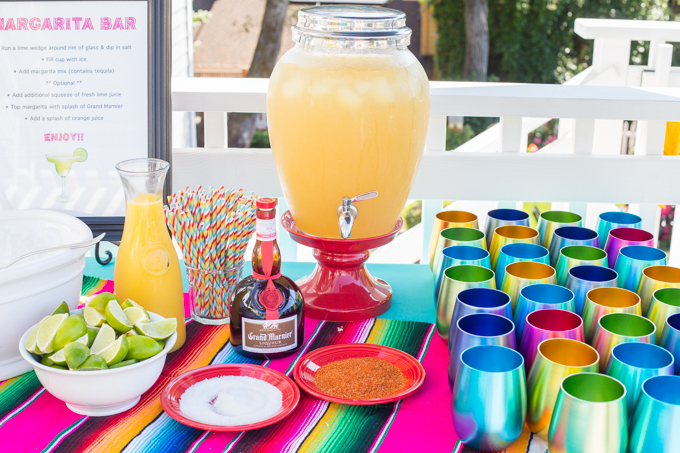 I found the serape table runners and the mini maracas on Amazon. 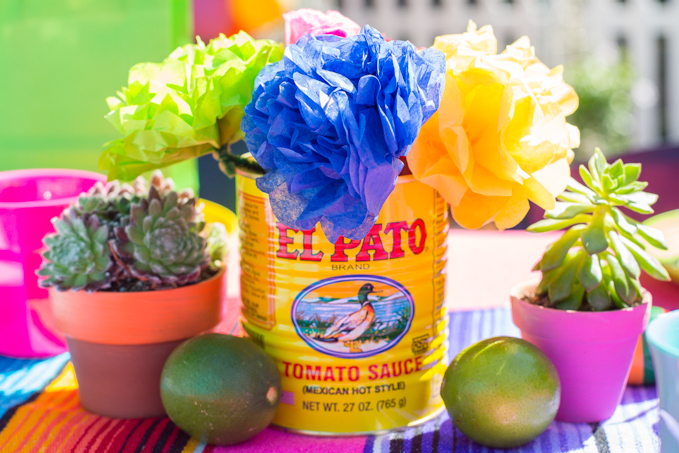 The centerpieces were simply empty Mexican branded cans filled with a few tissue paper flowers. 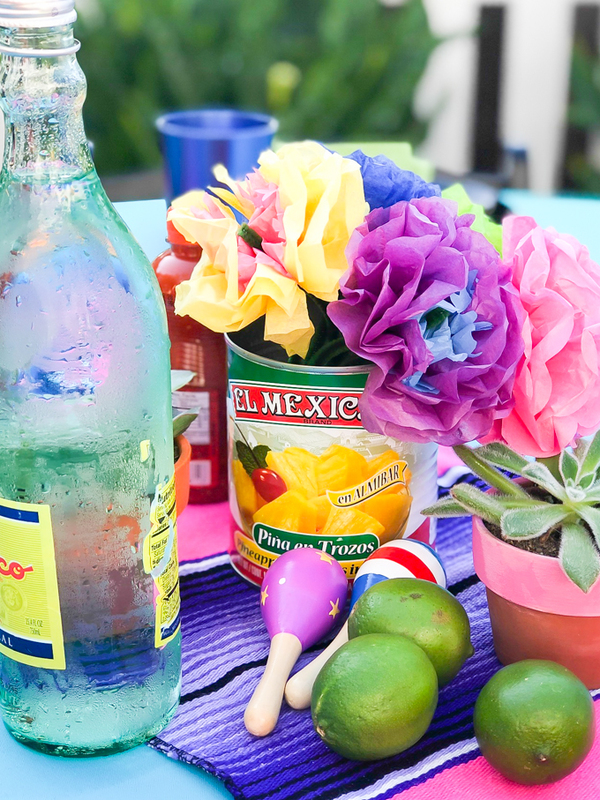 I also added three mini succulent plants in terra cotta pots (that the flower girls painted), a few limes, mini maracas, and a bottle of hot sauce. 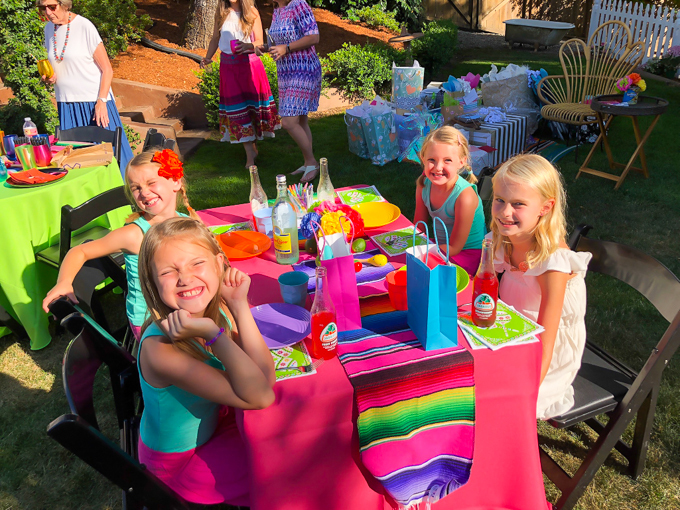 Each table also had a bottle of cold Topo Chico sparking water. The table for the little ones, included bright child sized plates, cups, and silverware, along with some coloring pages and party bags!! Once everyone was seated we did a quick welcome, shared some marriage advice, and gave a little blessing! I couldn’t have hosted this shower without the help of my daughters!! 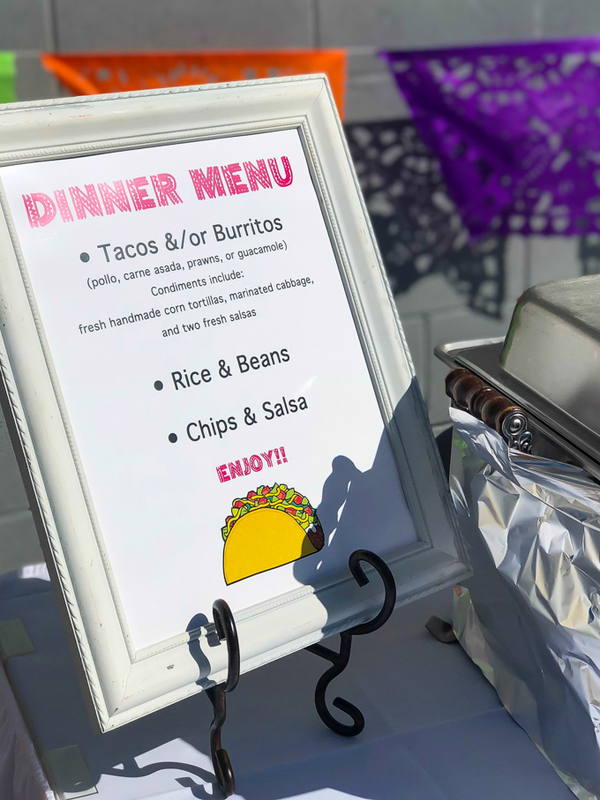 I don’t often do this, but I knew that our favorite Mexican restaurant (El Palomar) catered, so I hired them for the event. They do such a wonderful job of catering, including hand making their corn tortillas on site! Next up, of course, was dessert!! 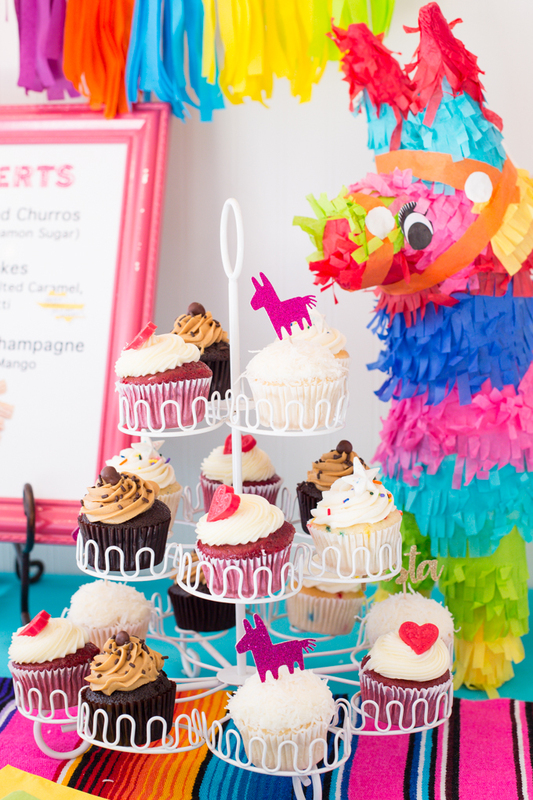 We served Fresh Baked Churros rolled in cinnamon sugar, fruit popsicles served in a splash of champagne, and an assortment of cupcakes (purchase from my local cupcake store). 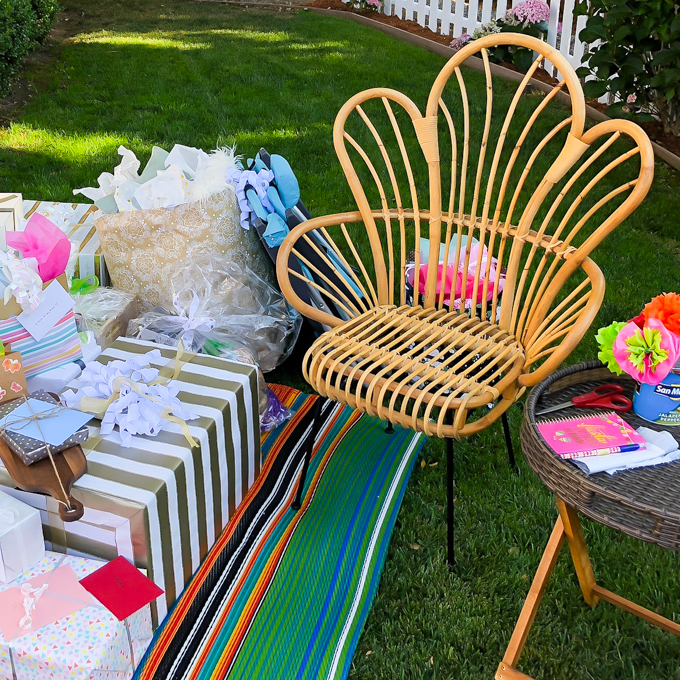 I always find it helpful to have a “spot” designated for gifts before the guests arrive. We placed a cute colorful outdoor mat down on the lawn and set a chair and little table next to it. 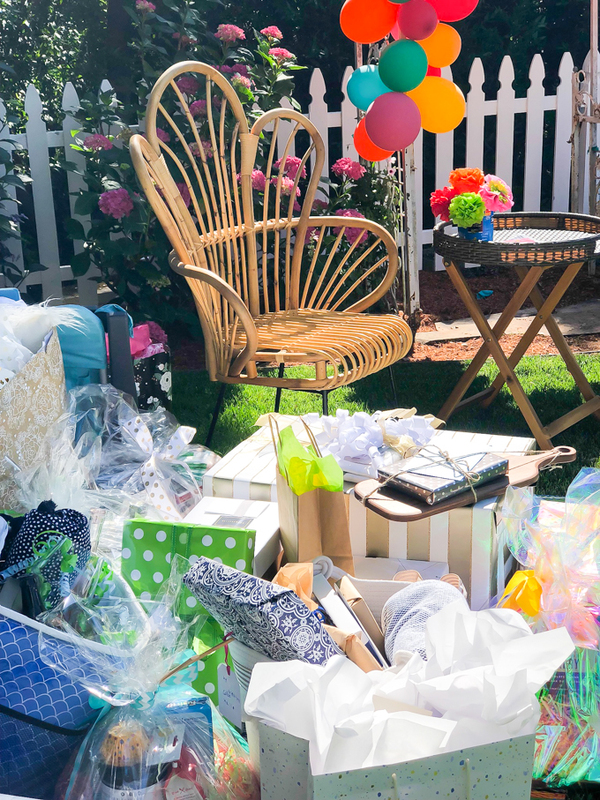 The guests knew exactly where to place their gifts and the bride was comfortable and front and center to all her guests when she opened gifts. The table offered the bride a place to set her drink and, thinking ahead, I already had a trash bag for the wrapping paper, a pair of scissors, and a notepad to write down the gifts. 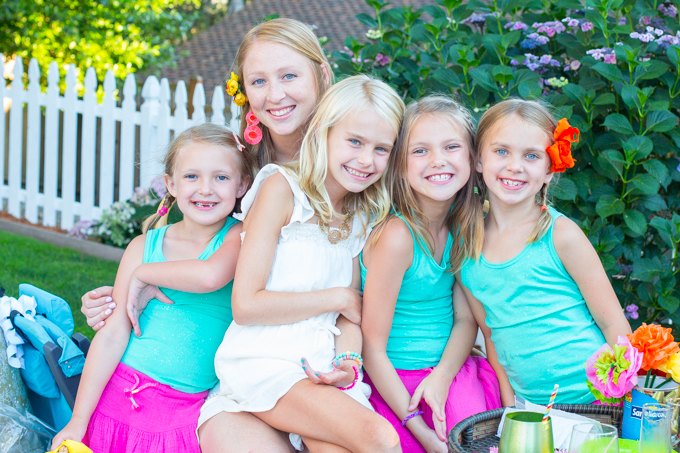 Of course, these little ones loved being as close as they could to the bride as she opened her gifts!! 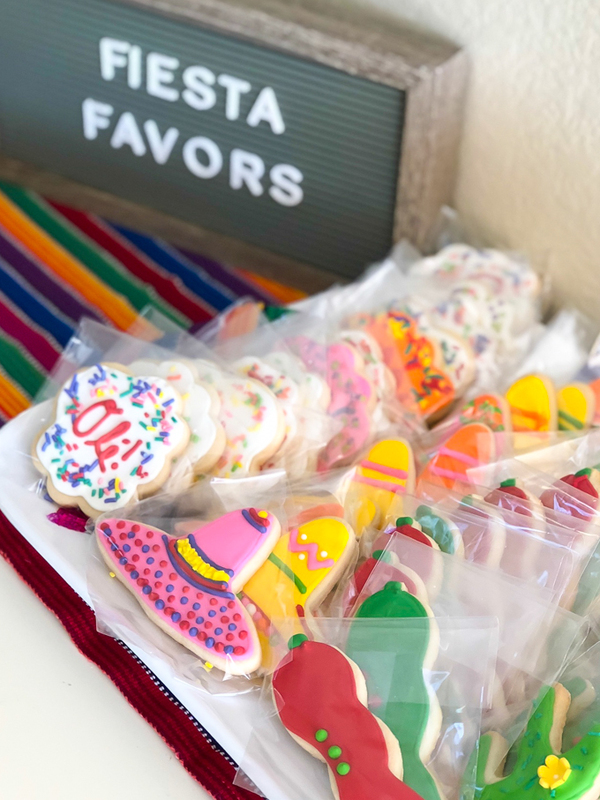 Guests left with a party favor of a homemade frosted sugar cookie! Homemade by me, and decorated with the help of my niece (the bride’s sister) and one of my daughters. 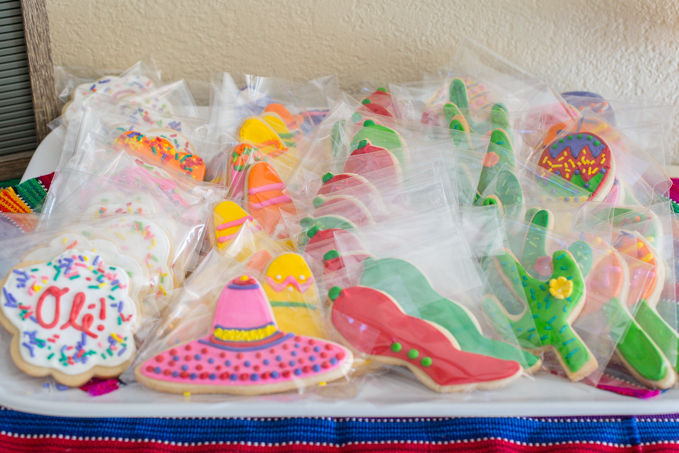 I think it’s safe to say that the bride-to-be had a great time at her Fiesta Themed Bridal Shower! Shop as far as you can in advance, saving just the fresh items to get the day before. Do as much kitchen prep as you can in advance. (I grilled the corn for the appetizer the day before, cut it off the cob, and placed in zip lock baggies. It only took a few minutes to finish the morning of the shower). Make any food you can the day before. Clean your house a day or two before (don’t worry about the rooms the guests won’t see). Remember that you don’t need to do all the food. Use a caterer! Purchase some/all of the desserts. If the party is indoors, you can do a lot of the set up the day before, including setting the table, setting out serving dishes, etc. If it’s outdoors, re-arrange any outdoor furniture, pull out ice bins, etc the day before. The morning of set up tables & chairs. I typically wait until a couple hours before the party to decorate the tables. Accept help! Either co-host the event, or, don’t be afraid to say yes if a friend offers to bring something or come over and help. 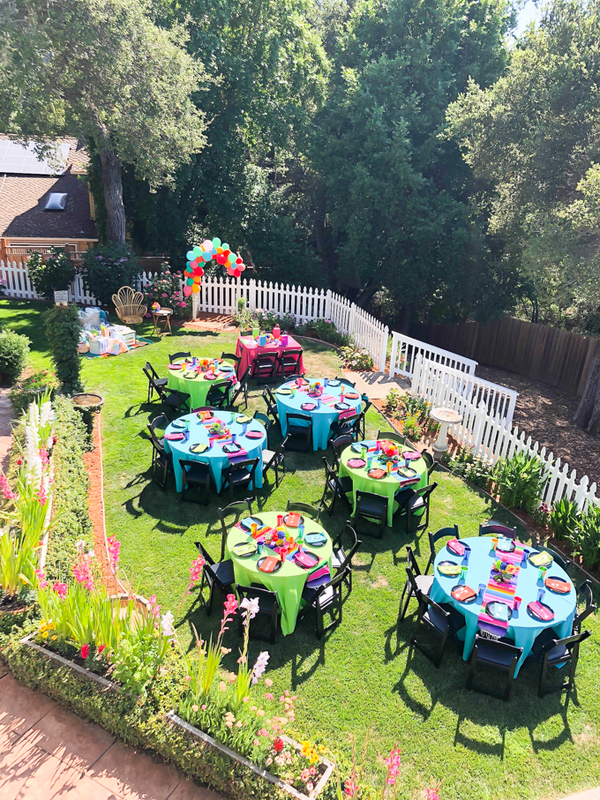 I enlisted the help of the flowers girls (they painted the succulent pots), the bride’s sister came over and helped decorate cookies, and my family all pitched in the day of. 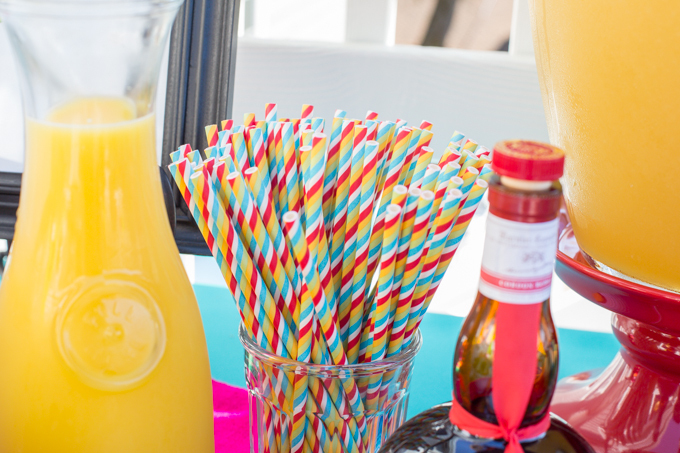 And this is one of my favorite tips – Hire kitchen help for a few hours during the party so that you can enjoy the party! 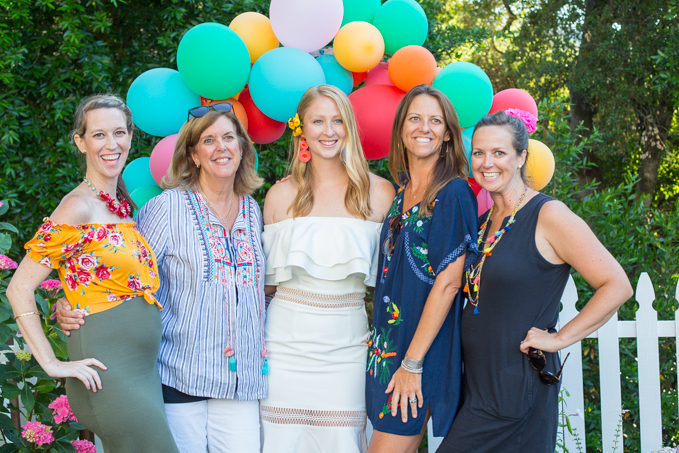 If you loved this post on How to Host a Fiesta Bridal Shower, you might also like this Aloha Themed Wedding Shower that I hosted. Or possibly this Baby Shower post. Feel free to share the love and Pin the image below to your favorite Pinterest board. 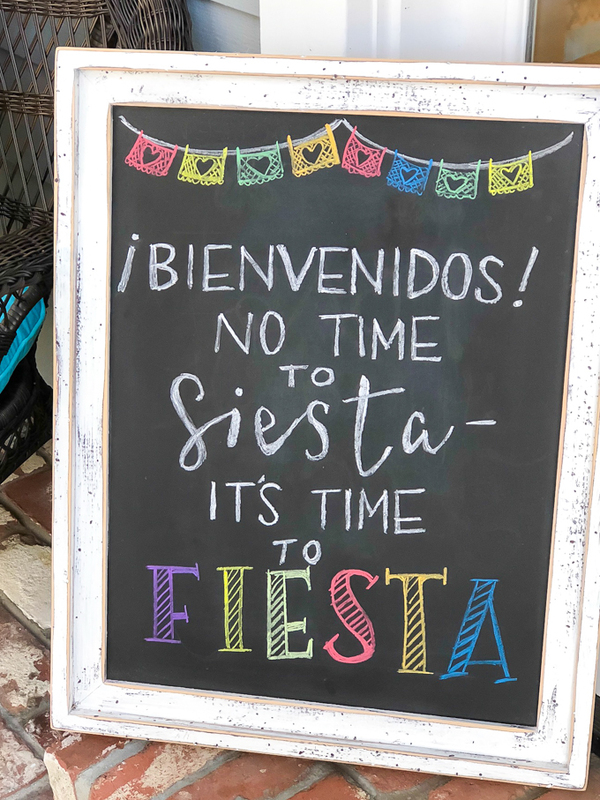 Where did you get your decorations from especially the fans and Fiesta sign?